If you think that you are in control of your job or your business, you’re wrong. And if you’re in marketing, branding, advertising, or business development, and you sit in offices to brainstorm new ideas, you’re missing out on the most powerful marketing consultant in existence: A teenager. I’m not kidding! If you want to know the future of marketing and the future of your job, you have to look to up-and-coming generations and the way they interact with trends. So: On today’s podcast, I’m sharing what I learned from my 14-year-old son about the latest trends. What he told me is the KEY to survival for companies in the coming decade. This one was my favorite episode to record yet. It’s a game changer—and it could save your job and your company from becoming obsolete. P.S. The #1 way iTunes knows to show my podcast to more people is if it has reviews! This month, if you leave a review on my podcast, I’ll send you my Write a New Script eBookthat takes you through 5 easy steps to create the life of your dreams. Click here to leave a review! Next: Promoting Mental Health on Campus? Start with New Student Orientation. 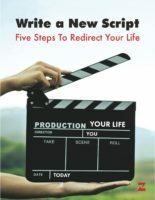 Write a new script for your life using Curtis' 5-step process. Delivered in a 40-page downloadable workbook.